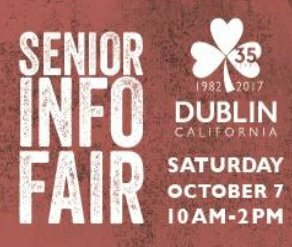 Join us this Saturday, October 7, 2017 for the 35th Annual Dublin Senior Info Fair! The City of Dublin, in cooperation with senior service professionals, is hosting a comprehensive “need to know” information fair designed for seniors, their adult family members, and caregivers. We encourage seniors and their families to PLAY, EXPLORE & CONNECT and learn about healthy lifestyles. Receive valuable information, referrals and services, including free flu shots, blood pressure checks, and balance and grip strength testing. 7600 Amador Valley Blvd, Dublin. For more information, please call (925) 556-4511 or email seniorctr@dublin.ca.gov.